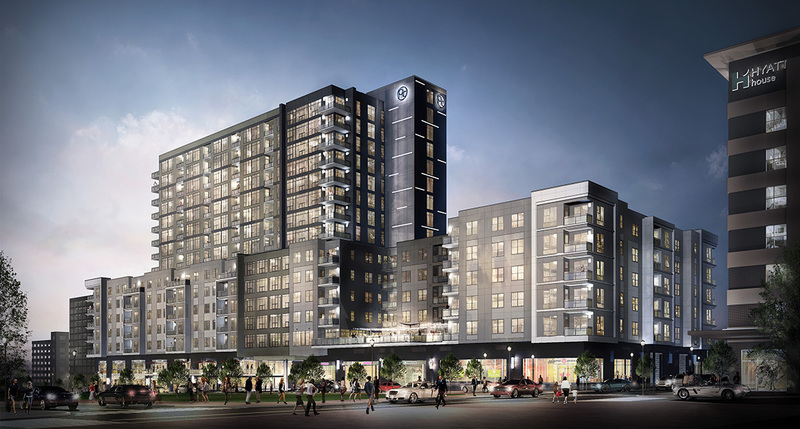 Competition among the Triangle’s luxury apartment market has heated up with the opening of the first phase of units at North Hill’s new 16-story Park Central mixed-use building. Park Central’s first tenants began moving in June 10, and community manager Lauren Bass says leasing is already ahead of schedule at 6.3 percent occupancy and 152 units finished. “We’re still doing final touch-ups,” she says of the construction crews still milling around. Plus, only about half of the building is even finished. Phase two, which includes all of the high-rise units on floors seven through 16, isn’t expected to be finished until November. But what’s opened already has the Triangle apartment market buzzing. The $100 million building project, a joint-venture project between Kane Realty Corp. of Raleigh and California-based KBS Realty Advisors, is one of the most expensive new development projects to date on the east side of Six Forks Road at North Hills. The combined mid- and high-rise building overlooks North Hills’ Midtown Park and amphitheater on one side and the I-440 Beltline on the other. It’s also flanked by the new Midtown Plaza office building to the east and the Hyatt House hotel to the west. Close to $285 million in new building projects at North Hills on Six Forks Road are expected to be complete in 2017 in addition to Park Central. The Cardinal at North Hills retirement community opened early in the year, the AC Hotel opened in March and the Midtown Plaza office building opened in April. On a recent tour of Park Central’s first phase, Bass said they’ve been keeping a close watch on competition in the market to make sure they stay competitive with rates and amenities. Park Central, for example, has a 709-square-foot, one-bedroom unit that starts at $1,490 per month, or $2.10 per square foot. A comparable apartment unit at the 23-story SkyHouse Raleigh apartment building downtown rents for between $1,863 and $2,938 per month, or $2.57 to $4.05 per square foot, according to Apartments.com. In addition to the 286 apartment units, Park Central will have 36,000 square feet of retail space, much of which has already been committed to prelease contracts with the Happy & Hale health food restaurant, Midtown Yoga, CycleBar, Kilwins Chocolates and Arrow Hair. Most of the retail is expected to open in fall or late 2017.